Two hundred years ago, the Nehalem Bay area included four villages of Tillamook Indians. 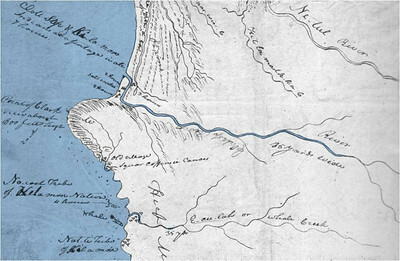 The journals of Lewis and Clark include maps showing Indian villages on Oregon's north coast. 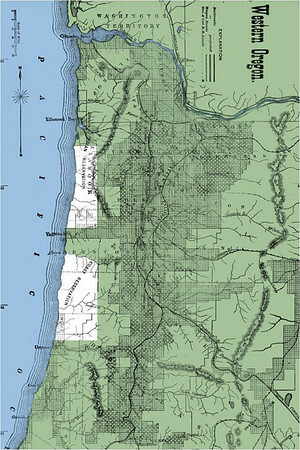 This map shows villages around today's cities of Seaside and Cannon Beach. It also identifies the location of the whale Indians rendered for oil that Clark wanted to buy. 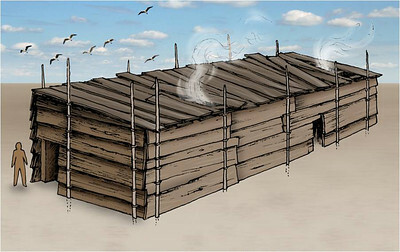 Indians lived in houses made of cedar poles and planks. Houses in villages occupied during warmer months served one or two families. Houses in central villages occupied during winter might be 100 feet long with areas for several families. 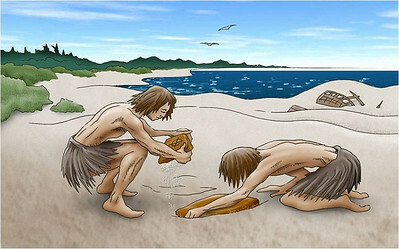 Cooking on the beach offered abundant fuel as well as food. Indians found tons of beeswax along the Nehalem Spit deposited by a shipwreck approximately in the year 1700. Beginning the 1840s, the beeswax proved valuable to trade with whites. After the Civil War, Americans began romantizing the disappearing Indians while continuing to take away their lands. 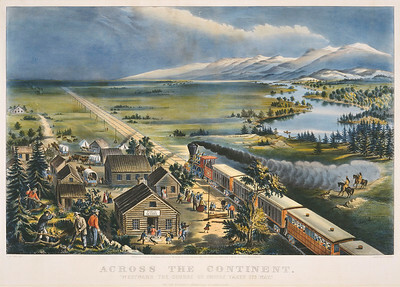 This drawning by Frances Palmer, published by Currier and Ives in 1868, captures the imagination and force of white invasion. 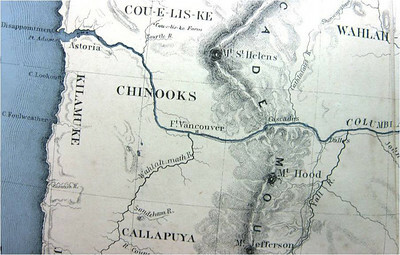 Lewis and Clark also located villages near along today's Nehalem and Tillamook Bays. 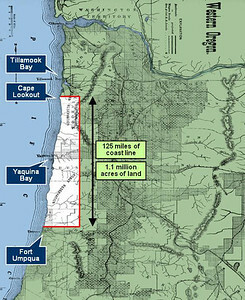 The explorers did not visit the area, but based this map on information provided by Indians they met near today's Cannon Beach. 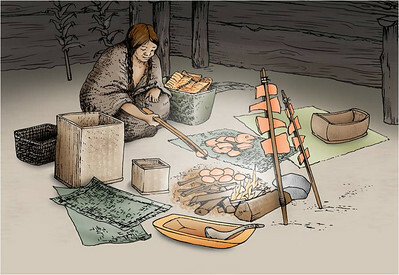 Indians used cedar bark to weave baskets for carrying and cooking. 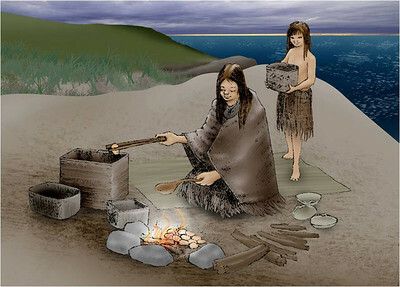 Indians often cooked by placing hot rocks in baskets of water. 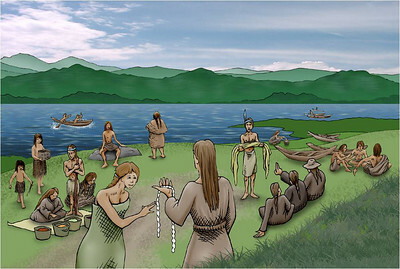 Trading on the shores of the Columbia River attracted Indians from north and south along the coast and inland as far as the gorge. 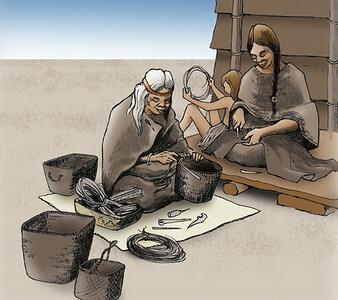 Lewis and Clark and later explorers all commented about how much skill Indians showed as traders. 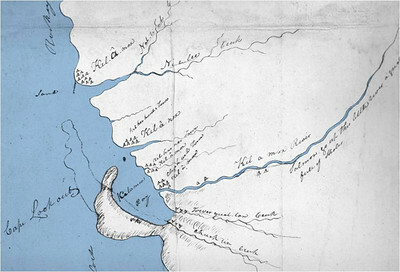 This 1848 map, based on reports by John Fremont, showed Killamuke country from Cape Lookout south past Cape Foulweather. 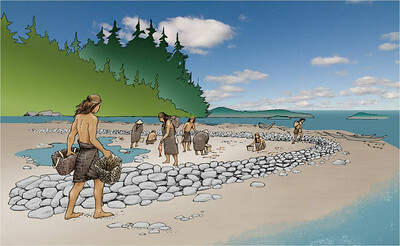 In some places, Indians could trap salmon behind stone walls. An incoming tide would bring fish; an outgoing tide would trap fish behind the wall. 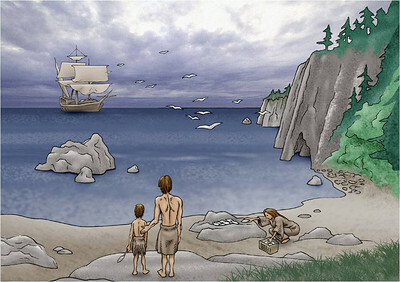 The first recorded interaction between Tillamooks and whites occured in 1788 when Robert Gray explored the northwest coast in this ship Columbia. Gray brought his ship briefly into Tillamook Bay. 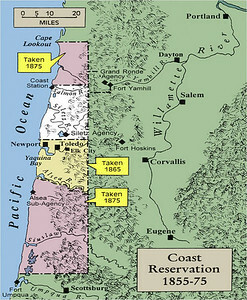 Federal and territorial authorities forced most Indians on the Oregon coast onto the Siletz reservation created in 1855. Indian lands stretched 105 miles from Cape Lookout to just south of today's Florence and east to the crest of the coast range. The reservation embraced 1.1 million acres in the watersheds of seven rivers: Suislaw, Alsea, Salmon, Silitz, Nestucca, Yachats and Yaquina. 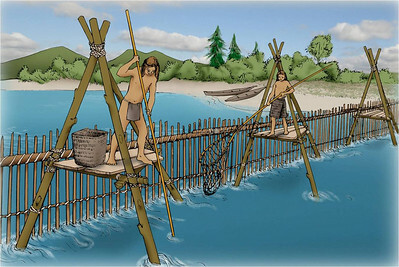 Indians placed their villages along bays and rivers protected from the open ocean. Seasonal villages, such as the one shown here, might have only a handful of houses. Winter villages might draw many hundred people. 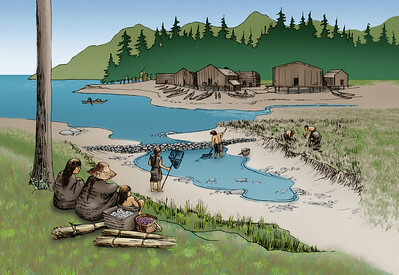 Abundant salmon kept Indians well fed during spring and fall. 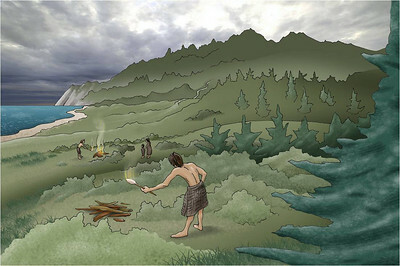 Indians throughout north America used fire to control the landscape. Burning brush off of Neakhahnie Mountain kept meadows open as forage for elk and deer. Whites wanted the rich oyster beds and farm lands near today's Newport, so persuaded federal authorities in 1865 to open the area for homesteading. Indians were forced to leave. 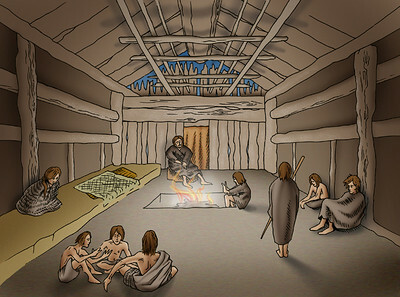 Indians used villages along Nehalem Bay during warmer months and moved to the main village on Tillamook Bay during the winter. 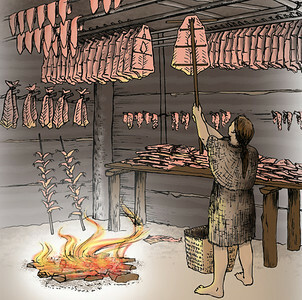 Salmon cured in smoke houses could feed Indians well into the winter. Burning by Indians had long-range consequences. When whites arrived near Neahkahnie Mountain in the 1870s, they found few trees on it's south side -- perfect for grazing sheep. 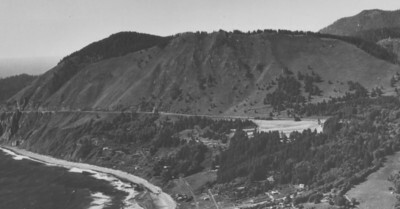 The sheep and an occasional fire kept trees off the mountain until the 1950s. Twenty years after creating the reservation, the federal government had reduced its size by almost 80%.